Space is the ultimate luxury. No human beings in a 50km radius. No electricity. No telephones. No clouds. Warm wind in your ears. Norechab covers 10 thousand hectares (roughly 22 thousand acres) in a shape roughly 15k by 7km. It is located south of Warmbad, Namibia, no further than 20km north of the Orange River. Its dry, its stark, its beautiful. It belongs to Heye Daun, Finn Behnken and Sean Gilbertson. Silence. Absolute. Stars. Trillions. Dry river beds. Two. Windhoek Specials (beer). An unbeatable combination. A picture of the Upington pass on the way to Namibia - see the tiny little Landrover at the bottom? From 11-14 February 1906, Norechab bore witness to The Battle of Norechab (at the "road" between Ramansdrift and Warmbad) which was fought between Johannes Christian and Friedrich von Erckert, with heavy losses for the Germans. Norechab has an old mining operation dating back to 1963 in the south west sector of the farm. Some 12 tiny buildings were erected to act as cottages for the miners, with a single, manual clean toilet! The miners went after tantalite and beryl but were not particularly lucky and the operation was closed. 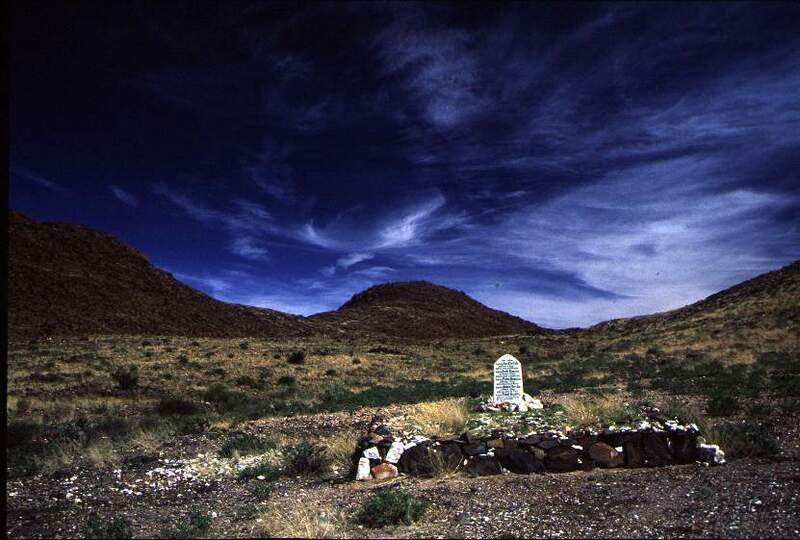 Here is a picture of the German graves after the battle of Norechab (although the graves are on a neighbouring farm called "Sandfontein", or "sand fountain"). Amazing what a polarising filter can do, eh?